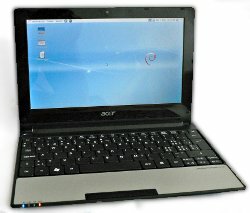 So, this Acer Aspire One netbook is running Debian Squeeze, in a very light, portable and cheap package. It's proving a very useful member of the computer family. But after a few months of use, how are we using it? Firstly, it's a great way to quickly check a webpage, or to read and send email, from the comfort of the kitchen table or the sofa. The screen is obviously not big, and not high resolution, but using F11 to maximise the iceweasel window helps to see more of what's going on. I also auto-hide the task bar at the bottom to save a bit of vertical space. It's also great for skyping, including video, and handles it all very well, from anywhere in the house, making it much more convenient and flexible than using the desktop. I haven't done any serious word-processing or other office work on this netbook, that's not what it's for, but I did reluctantly install OpenOffice Writer to be able to at least read documents, and that works fine. I have done a fair bit of python programming with it, very conveniently on the train, but just with gedit and the command line. And it's very comfortable doing that too. I really wasn't sure about running eclipse on it, but actually it's not too bad either. Even with a few acceptable delays and little pauses here and there where it thinks about the autocompletion, it's really quite usable, and again I've used this quite a bit on the train for java programming, quite successfully. I've also used it for writing latex documents, but I haven't installed the latex system itself on this netbook, I just edit the files on here and then transfer them back to the main desktop for compiling. And of course for editing text, and even simple gimp and inkscape tasks, it performs fine. Not blisteringly fast, but quite acceptable, and better than I expected to be honest. At the moment I only use my own wireless connection at home, and don't use any wireless stuff when I'm on the move. However, if I open slashdot while having my breakfast, open a few tabs for the interesting-sounding stories, and then close the lid, it suspends really fast, and I can read through all the tabs on the train with the wireless card switched off (Fn-F3). I assume that switching off wireless also saves battery power, but I haven't tested it. In any case, the suspend and wake-up are both really fast and convenient, and worked straight out of the box. Of course any time I edit text files, webpages, program files, document files or graphics (ok, editing anything!) on the netbook, I have to make sure that I don't get confused about whether the desktop or the netbook has the latest version of something. I don't want to waste or lose my hard work! That's where the fabulous rsync tool comes in, synchronizing whatever's new from the desktop onto the netbook, and whatever's new from the netbook back onto the desktop. And of course you can run rsync over ssh, making a secure connection. For individual files you can also use scp which is similarly secure. And to just connect and browse around the desktop, you can use ssh on its own. If you use ssh -X desktop, then you can export the X display of the programs running on the desktop, so that they display on the netbook. So you can even run eclipse (or any other program) on the desktop while lying on the sofa! Of course this isn't the most efficient way to do things, but it's quite useful, and very cool. The usual way to do things is to pull files using rsync before a trip, then work on the netbook on the train, and then rsync back to the desktop after returning home. In case of doubt, the "n" option just displays which files would be synchronized, without actually synchronizing them. There's a particular radio station I like to listen to, which streams fine on the desktop but refused to work on the netbook, even though they're both Debian Squeeze. It just said it required some kind of plugin for "mplayer2" and that the plugin couldn't be found. At first I thought this was something to do with mplayer, but installing that didn't make any difference. The working computer managed to load some kind of plugin, from which "About" said that it was a Totem browser plugin using gstreamer. So on the netbook I also had totem installed, and totem-plugins and gstreamer and all sorts of other packages, but still no radio. Eventually I managed to solve it. From the working browser I went to "about:plugins" and that showed that it was a "Windows Media Player Plug-in" which was dealing with the mplayer2 mime type. And that seemed to be contained in a file called "libtotem-gmp-plugin.so", which sounded promising. Except I already had totem-plugins, so which package was providing this? I could see that libtotem-gmp-plugin.so was present on the working machine, in /usr/lib/mozilla/plugins, but was absent from the netbook. To find out which package was responsible, on the working machine I typed "dpkg -S libtotem-gmp-plugin.so" and got the answer "totem-mozilla". And sure enough, this package was installed on the working machine but not on the netbook. So on the netbook "aptitude install totem-mozilla" brought in the package, and instantly problem solved. And another trick in the toolbox, "dpkg -S" to find which package provides a specified file. Neat.